New Mexico’s a desert, right? Sure, the Land of Enchantment has plenty of cactus-studded range, but New Mexico’s Sangre de Cristo Mountains are the southern range of the Rockies. Thanks to cold, dry air and elevations topping twelve thousand feet, New Mexico gets the powder that skiers and snowboarders crave to carve. Four-season New Mexico makes a perfect February destination, whether you’re looking for a snowy, romantic Valentine’s Day getaway with your loved one or you’re starting to think of a spring break adventure with your little ones. 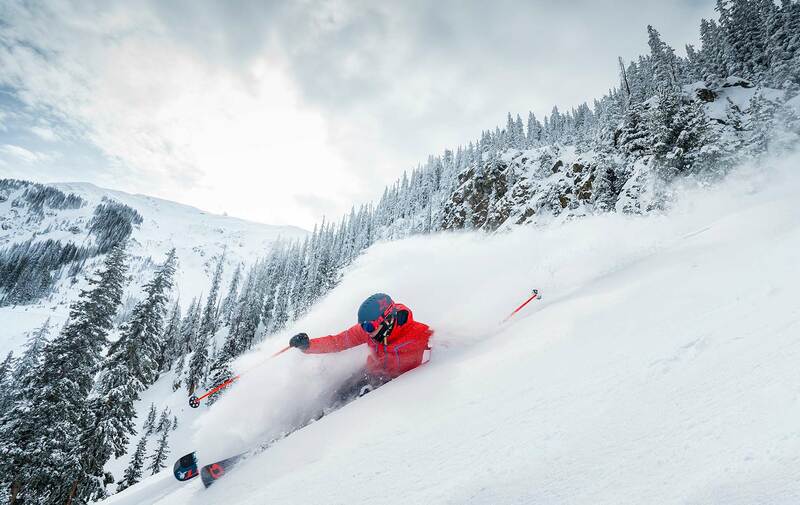 Mix in robust Native American and Hispanic history, its renowned spicy cuisine, world-class spas, shopping, art, and budget-friendly lift tickets, and New Mexico makes a vibrant ski destination that encourages beginners and challenges the experienced. Here's a roundup of the state’s eight ski and snowboarding areas and resorts to consider for a midwinter getaway. 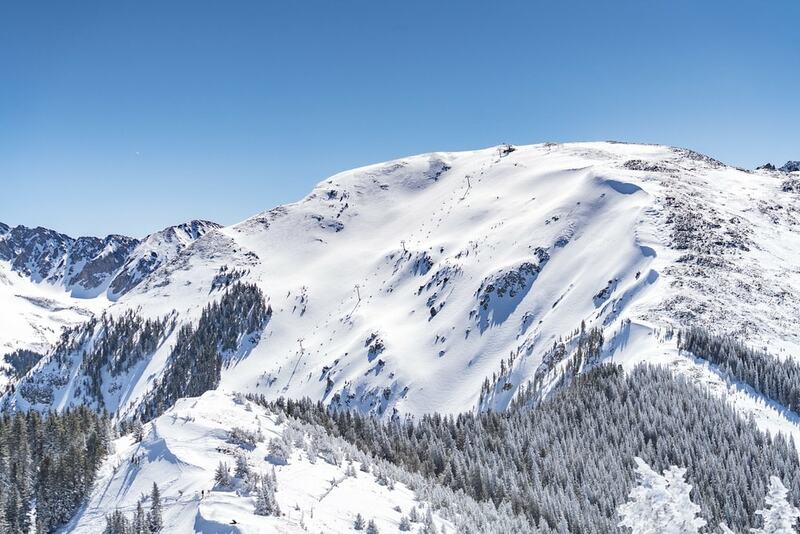 New Mexico’s ski areas are vibrant destinations that encourage beginners and challenge even the most experienced skiers and snowboarders. Ski boots are right at home next to cowboy boots at New Mexico’s northernmost ski area, Red River Ski & Summer Area. The base starts right next to the three-street town of Red River, so many of the Western-style properties here have door-to-lift convenience. On the mountain, 70 percent of the trails are rated beginner and intermediate, with 30 percent as expert. Li’l Buckaroos Child Care keeps children six months to four years entertained while parents and older siblings hit the slopes, and lessons at the Youth Ski & Snowboard Center help young skiers and boarders improve their skills. Three terrain parks are favorites for the daredevils in your group, and tubing opens at 4:15 p.m. daily, as does night skiing. Get another adrenaline rush on the Pioneer Flyer zip line or Hidden Treasure Aerial Park, and let the good times roll at the annual Mardi Gras in the Mountains celebration, February 8–13, 2018. Taos Ski Valley is the perfect place for adventure lovers or those looking for a relaxing day at the spa after time spent on the slopes—you might even make some new friends! The Blake at Taos Ski Valley is an excellent choice for both romantic getaways and adventure-filled family vacations. The newly opened alpine-style hotel features a spa, fireside dining at 192 at The Blake, and childcare for kids as young as two months. 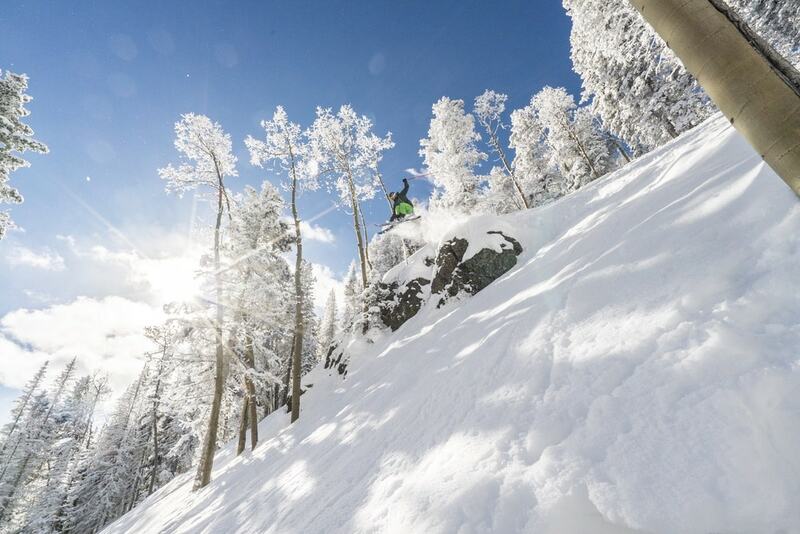 With 51 percent of its trails rated black diamond, Taos is king of the New Mexico mountains when it comes to expert skiing, and its 12,481-foot Kachina Peak has a 3,274-foot vertical payoff. But don’t let that scare you off; the Ernie Blake Snowsports School is considered one of the best in the country, and the Pioneer Lift accesses a new beginner’s slope area. Enjoy drinks fireside at Rhoda’s Restaurant or the Martini Tree Bar, and savor authentic German cuisine at the Bavarian Restaurant. Check out package deals, such as 50 percent off an adjoining room and 20 percent off lodging, dining, and spa services, at SkiTaos.com/packages. Off the slopes, visit Taos Pueblo, a UNESCO World Heritage Site, and enjoy the shopping and romantic dining in nearby Taos. With an indoor pool and hot tub, pet-friendly rooms, lodge-to-lift accommodations, and gear storage just feet from the Chile Express chairlift, full-service Angel Fire Resort is one of the nation’s most family-friendly ski destinations with 76 percent of its trails rated as beginner and intermediate. 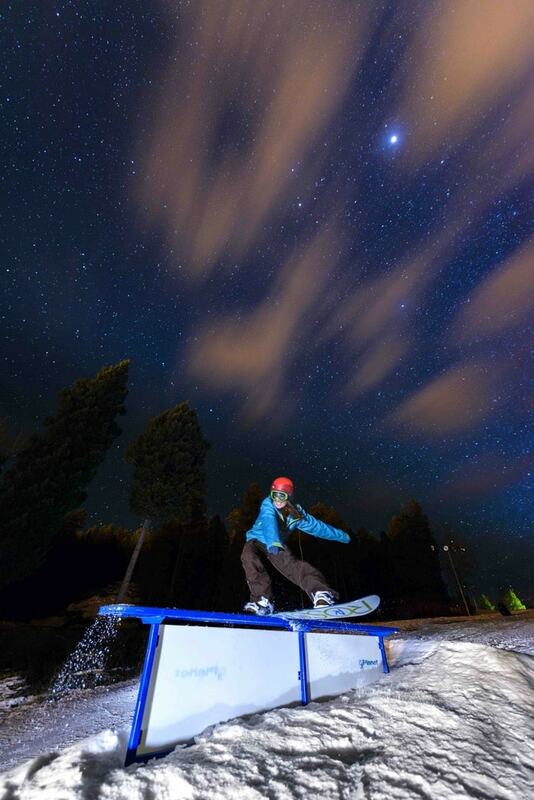 Night skiing and boarding are available from 4 to 8 p.m., and winter zip-lining has adventurers careening from the 10,600-foot summit two hundred feet above the ground down to the base. On-site restaurants include Elements with its 1,800-bottle private wine room for romantic dinners and Chianti’s for family pizza. The Polar Coaster shoots tubers down a thousand feet of groomed, lighted lanes, and kids six and younger get a free lift ticket—as do fifth graders with a valid report card. 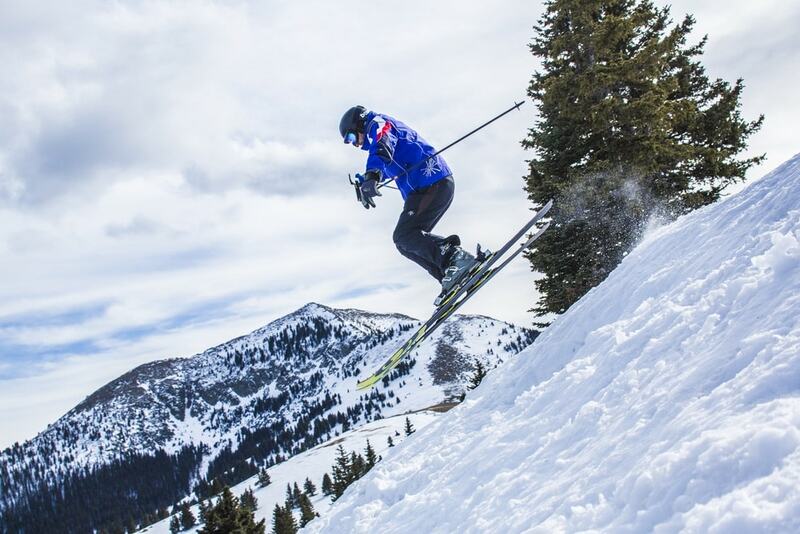 This February, check out the World Championship Shovel Races (February 2–3), during which participants scream down the slopes on snow shovels, and Military Winterfest (February 22–26), organized and hosted by the National Veterans Wellness and Healing Center Angel Fire. The festival features exclusive discounts and activities for military members, past and present, and their families. Designed as a private ski area for employees at the once top-secret Los Alamos National Laboratory, Pajarito in the Jeméz Mountains is now open to the public and is a New Mexico favorite for its challenging and uncrowded trails. The Never Ever packages combine lessons and lift tickets for those new to skiing and snowboarding, and beginner packages and group lessons are available for kids and adults who’d like to improve. Explore Santa Fe just forty-five minutes away and the ancient Native American ruins at nearby Bandelier National Monument. Skiers enjoying the Sipapu slopes! Go to SipapuNM.com to get special deals for your next getaway. 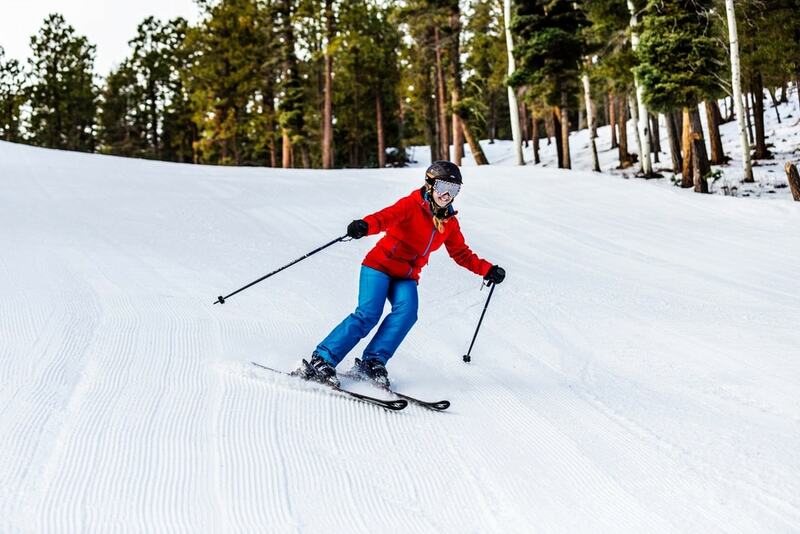 Family-owned Sipapu Ski and Summer Resort is known locally for its generous—if not somewhat quirky—deals: Active duty military, kids under six, fourth-graders (with a report card), forty-year-olds, sixty-year-olds, and seventy and older ski free. Kids seven and older who have never skied or snowboarded get a free lesson with the purchase of a full-day, full-price ticket. With the purchase of a $45 full-day adult lift ticket, guests can stay a night for free in the on-site hotel. On Car Load Days, up to five people in a single vehicle can ski or board for $50 total. Savings aside, Sipapu is a fun mountain with enough challenges to satisfy experienced skiers and boarders despite its smaller footprint. Try ski biking and the terrain park that is made entirely of logs from the nearby forest. Paradise Bar and Grill and Riverside Cafe at the base serve New Mexico cuisine, with happy hour specials daily from 4 to 6 p.m. The lodge rooms are purposefully simple—no TVs or phones. Taos is just twenty miles away, while Santa Fe is sixty-five miles away for fun day trip options. Just sixteen miles from the Santa Fe Plaza, Ski Santa Fe has a 10,350-foot base and 12,075-foot elevation; 60 percent of its trails are rated beginner and intermediate. La Casa Lodge has gear shops and restaurants, and Totemoff’s Bar on the slopes is a local favorite for a burger, beer, or mixed drink around the fireplaces. Mogul and glade lovers thrill at the terrain and the views from the top of the Millennium Triple Chairlift. Chipmunk Corner Children’s Center has day care, a snow play area, and ski and snowboard lessons for children three and older, and its adaptive ski program ensures everyone can enjoy the slopes. Skiing in Albuquerque? 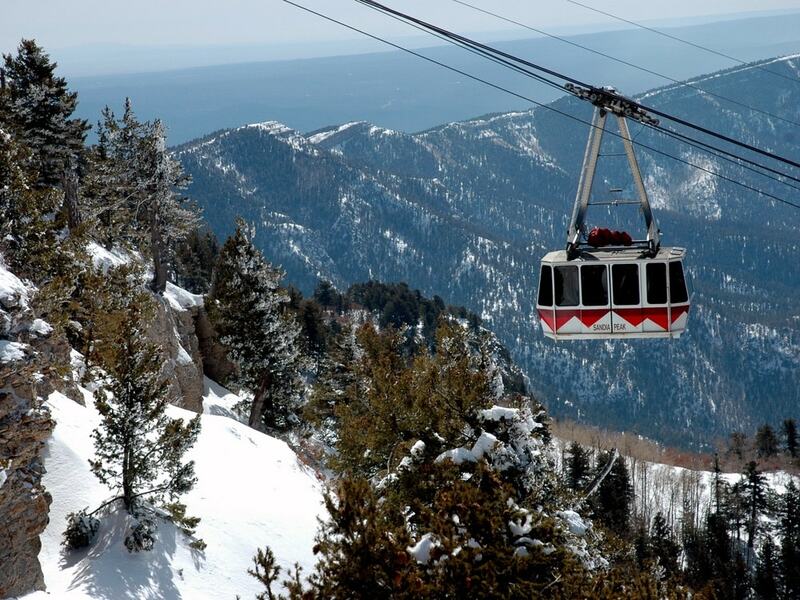 At the top of 10,377-foot Sandia Peak east of New Mexico's largest city is Sandia Peak Ski and Tramway, a small but scenic area where you can ski a half day and still have time to enjoy Albuquerque. Drive up the picturesque eastern backside of the mountain along NM-536 for forty minutes from Albuquerque, or take the Sandia Aerial Tramway for a beautiful fifteen-minute trip up the mountain’s western face above the Sandia Mountain Wilderness. Build confidence on Sandia’s beginner and intermediate slopes, which make up 90 percent of the run, or go big at the Scrapyard terrain park. Down in Albuquerque, enjoy Southwest-flavored romance at any number of local restaurants and hotels or family fun at Explora Science Center and Children’s Museum, the ABQ BioPark, and other attractions that parents will love, too. Calling all adventurers! 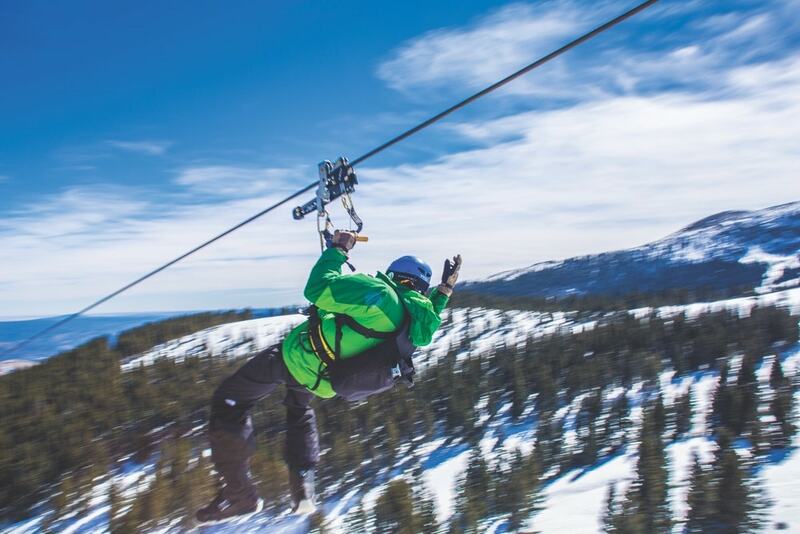 Hop on the Apache Wind Rider zip line through the New Mexico mountains and take in the beautiful views. 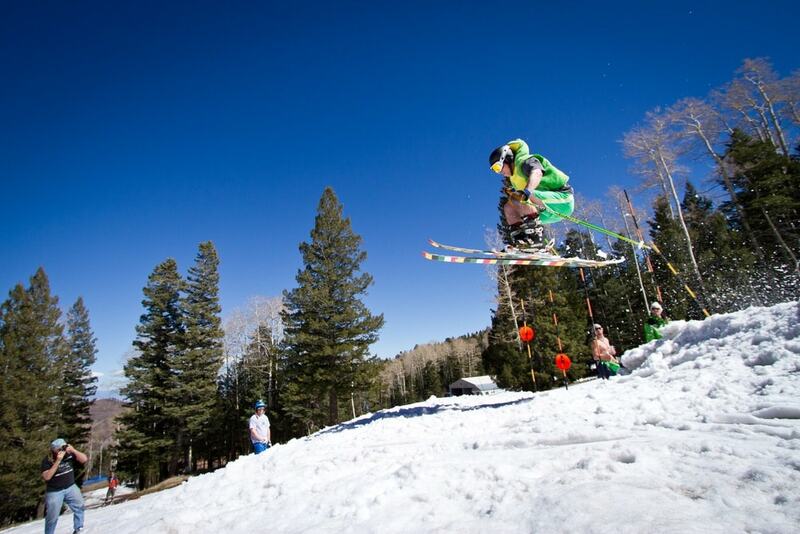 Ski Apache is the state’s southernmost ski area and the nation’s first ski resort to offer casino-style gaming. Explore nearby Ruidoso for shopping and dining, and check out the Hubbard Museum of the American West in Ruidoso Downs. Ski Apache near Ruidoso in southern New Mexico is North America’s southernmost ski area. Owned and operated by the Mescalero Apache Tribe, its eleven ski lifts include enclosed eight-passenger Doppelmayr gondolas. Located at 11,500 feet on inactive volcano Sierra Blanca, Ski Apache’s Elk Lodge has slot machines, making it the first ski resort in the nation with casino-style gaming. Four on-site restaurants keep everyone fueled, and the Spirit Bar in the main lodge helps take the edge off after a day on the 750 acres of slopes (75 percent are beginner and intermediate trails). Try out the Trikke Skki (a three-ski snow bike), race down the tubing run, or soar down its 8,890-foot-long Apache Wind Rider ZipTour. The nearby Mescalero-owned Inn of the Mountain Gods has 273 luxury rooms, fine dining, an eighteen-hole championship golf course, an indoor pool, live music at Club 49, and a casino. Shop nearby Ruidoso’s charming downtown, and explore cowboy history at the Hubbard Museum of the American West in nearby Ruidoso Downs. No matter your style, you’ll find a winter sports oasis in the Land of Enchantment. For more information, package deals, and current conditions, visit SkiNewMexico.com and check out NewMexico.org for general visitor information. Travel writer Steve Larese and his wife, Kat, spent many a winter date on the slopes before getting married. They now ski with their daughter and two sons. Follow him on Instagram @SteveLarese.